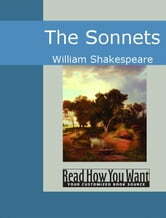 Shakespeare&apos;s Sonnets is a collection of one hundred and fifty four sonnets written over a period of several years and published in a 1609. The sonnets deal with a variety of themes, such as love, politics, mortality, the beauty of the author&apos;s lover, and the destruction of that beauty. Seventeen are addressed to a young man, while twenty five sonnets are addressed to a fair lady, expressing the author&apos;s love for her.